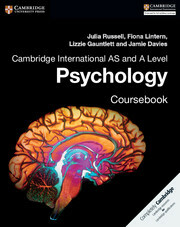 This vibrant coursebook is tailored to the Cambridge International AS and A Level Psychology (9990) syllabus for first examination in 2018 and is endorsed by Cambridge International Examinations. It contains rigorous, comprehensive coverage at the most appropriate level of depth and detail for the course. The coursebook contains extra focus on the key concepts of research methods and ethics as well as crucial debates such as nature versus nurture. The content encourages the development of necessary skills of analysis, interpretation, application and evaluation and promotes understanding of ethical and moral issues and their implications for psychological research. Encourages the development of necessary skills of analysis, interpretation, application and evaluation. Promotes understanding of ethical and moral issues and their implications for psychological research. Novel exam-style questions thoroughly prepare students for assessments. Straightforward writing style and engaging internationally relevant examples make the Coursebook ideal for international learners. 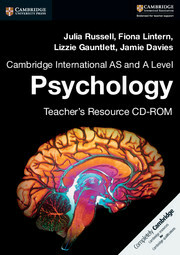 Written by an author team of respected teachers with experience of writing over 30 books. Colourful and highly attractive design to engage students and promote quick reference to important pedagogical features. Accompanied by tailored teacher's resources to support teachers throughout the whole course.